At a high level, there are three concerns when creating Kudu tables: column design, primary key design, and partitioning design. Of these, only partitioning will be a new concept for those familiar with traditional non-distributed relational databases. The final sections discuss altering the schema of an existing table, and known limitations with regard to schema design. Data would be distributed in such a way that reads and writes are spread evenly across tablet servers. This is impacted by partitioning. Tablets would grow at an even, predictable rate and load across tablets would remain steady over time. This is most impacted by partitioning. Kudu takes advantage of strongly-typed columns and a columnar on-disk storage format to provide efficient encoding and serialization. To make the most of these features, columns should be specified as the appropriate type, rather than simulating a 'schemaless' table using string or binary columns for data which may otherwise be structured. In addition to encoding, Kudu allows compression to be specified on a per-column basis. Unlike HBase, Kudu does not provide a version or timestamp column to track changes to a row. If version or timestamp information is needed, the schema should include an explicit version or timestamp column. The decimal type is a numeric data type with fixed scale and precision suitable for financial and other arithmetic calculations where the imprecise representation and rounding behavior of float and double make those types impractical. The decimal type is also useful for integers larger than int64 and cases with fractional values in a primary key. The decimal type is a parameterized type that takes precision and scale type attributes. Precision represents the total number of digits that can be represented by the column, regardless of the location of the decimal point. This value must be between 1 and 38 and has no default. For example, a precision of 4 is required to represent integer values up to 9999, or to represent values up to 99.99 with two fractional digits. You can also represent corresponding negative values, without any change in the precision. For example, the range -9999 to 9999 still only requires a precision of 4. Scale represents the number of fractional digits. This value must be between 0 and the precision. A scale of 0 produces integral values, with no fractional part. If precision and scale are equal, all of the digits come after the decimal point. For example, a decimal with precision and scale equal to 3 can represent values between -0.999 and 0.999. Kudu stores each value in as few bytes as possible depending on the precision specified for the decimal column. For that reason it is not advised to just use the highest precision possible for convenience. Doing so could negatively impact performance, memory and storage. Decimal values with precision of 9 or less are stored in 4 bytes. Decimal values with precision of 10 through 18 are stored in 8 bytes. Decimal values with precision greater than 18 are stored in 16 bytes. Each column in a Kudu table can be created with an encoding, based on the type of the column. Every data set will compress differently, but in general LZ4 is the most performant codec, while zlib will compress to the smallest data sizes. Bitshuffle-encoded columns are automatically compressed using LZ4, so it is not recommended to apply additional compression on top of this encoding. Primary key columns must be non-nullable, and may not be a boolean, float or double type. Primary key indexing optimizations apply to scans on individual tablets. See the Partition Pruning section for details on how scans can use predicates to skip entire tablets. Choosing a partitioning strategy requires understanding the data model and the expected workload of a table. 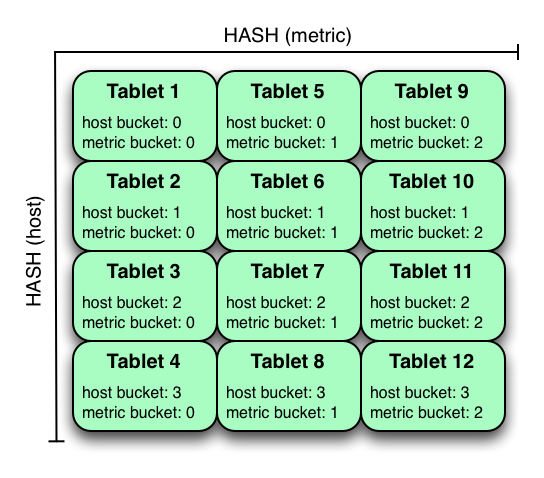 For write-heavy workloads, it is important to design the partitioning such that writes are spread across tablets in order to avoid overloading a single tablet. For workloads involving many short scans, where the overhead of contacting remote servers dominates, performance can be improved if all of the data for the scan is located in the same tablet. Understanding these fundamental trade-offs is central to designing an effective partition schema. Kudu does not provide a default partitioning strategy when creating tables. It is recommended that new tables which are expected to have heavy read and write workloads have at least as many tablets as tablet servers. see the Range Partitioning Example for further discussion of range partitioning. see the Hash Partitioning Example for further discussion of hash partitioning. see the Hash and Range Partitioning Example and the Hash and Hash Partitioning Example for further discussion of multilevel partitioning. The second example is more flexible than the first, because it allows range partitions for future years to be added to the table. In the first example, all writes for times after 2016-01-01 will fall into the last partition, so the partition may eventually become too large for a single tablet server to handle. Although these examples number the tablets, in reality tablets are only given UUID identifiers. 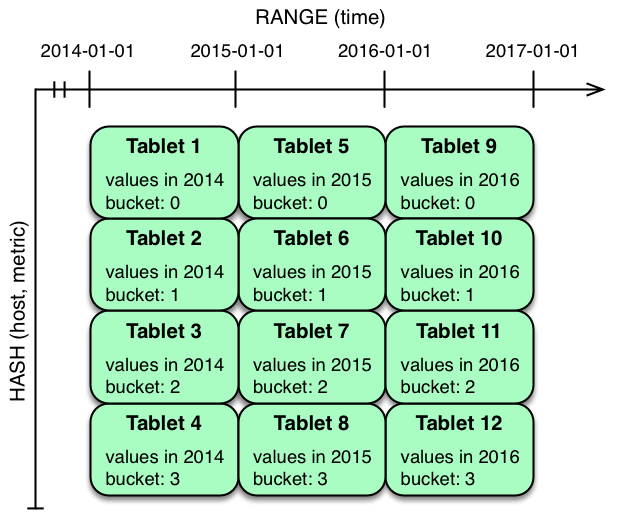 There is no natural ordering among the tablets in a hash partitioned table. Kudu currently has some known limitations that may factor into schema design. Although individual cells may be up to 64KB, and Kudu supports up to 300 columns, it is recommended that no single row be larger than a few hundred KB. Identifiers such as table and column names must be valid UTF-8 sequences and no longer than 256 bytes. Kudu does not allow you to update the primary key columns of a row. Kudu does not allow you to change how a table is partitioned after creation, with the exception of adding or dropping range partitions. Kudu does not allow the type of a column to be altered. Partitions cannot be split or merged after table creation.